I’ve wanted to eat at Golden West Cafe for a while now and on Sunday I had the opportunity to go. The food was excellent and the ambiance appealing. In short, I really enjoyed it. I’ve been told that service was often lackadaisical by more than one person, but I didn’t have any complaints. We were greeted and seated quickly by the voice of Tom Petty and a nice gentleman in cutoff shorts and long hair. His look reminded me of Wayne’s World, actually. I was surprised by the pleasantness, since they were closing at 8:45 and we had arrived at 8:20. Water was provided immediately and our server was patient with us when we needed a little extra time deciding. We did determine that the Tom Petty album was being played it it’s entirely, which was just fine. 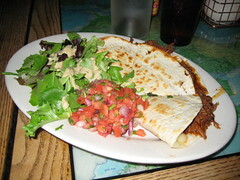 I ordered the dinner quesadillas, opting for the carne adovada and jack cheese ($10) version. Their adovado is finely shredded pork that’s been marinating in some kind of sauce that includes “chimayo red chile powder, Mexican Cinnamon Canela, and Mexican Oregano.” The web site suggests that these ingredients “imbue a unique, authentic flavor.” Hell, not only that but it’s delicious, spicy, and slightly greasy. It is mentioned on the menu that it is one of the spiciest things they’ve got and I believe it. I’m not into super spicy food but was feeling ballsy that night. I admit I was sweating a little and I’m pretty sure my lips were numb by the end of the meal, but I’m get it again in a slightly irregularly paced heartbeat. The side of fresco salsa on the side was fresh and provided a better dressing to the side salad than the dressing. My dining companion decided upon the Thai Salad with shrimp ($13). 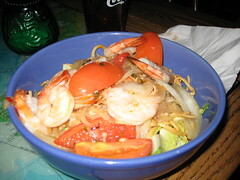 Those shrimp were perfectly cooked and served over romaine lettuce, quartered tomatoes, and cold peanut noodles in a complex sauce. The sauce was rich and rather indescribable, though not as much heat as typical peanut-style sauce. I only had a bite or two, but it tasted pretty good to me. The layout of Golden West Cafe is sporadic. It looks organic, like the tables and booths were just placed wherever the movers had placed them. There’s a good mix of non-matching large and small tables suitable for most size groups. Wire-style lighting, exposed ventilation ducts, and a lot of color adorn the otherwise industrial-looking room. It’s very non-conforming and different, but it works. The busing station — with Japanese lanterns hanging from a fake tree above — divides the room, meaning your server doesn’t have to traipse all over the place to refill water or clear plates. Golden West has a lot of policies, including a no cell policy. Rock on, guys! Another is no substitutions. I’m not sure why that bugs me because I don’t make a point of substituting anything, but it did at first. Not to worry, I love the no cell policy and their reasoning is pretty sound; they think their stuff is best the way they prepared it, particularly with the chili sauces. They also have a bunch of vegetarian and vegan options, which I didn’t try but sounded rather appetizing. I’ll be back, but know that Tom Petty only plays until 9. I was there last night! If you sit at the bar on Tuesday nights, you can get 2 dollar margaritas until 8 PM. Last night I got the applewood smoked bacon sandwich which was pretty good. Their peanut noodles are good as well. You forgot the best part. The bathroom walls are lined with vintage album covers. I feel guilty for lingering so long in there. TBB: I like the sound that; both cheap margaritas and bacon. I have a feeling that I’ll return there soon. yellowjkt: I don’t know if I’d say the “best” part, but I did mention to my dining partner that there was a “Pump up the Jam” LP cover above the urinal. Definitely a unique place all around.